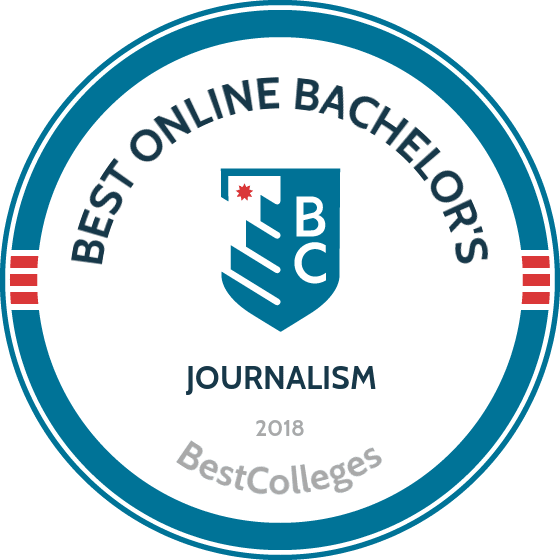 What Are The Best Online Bachelor's in Journalism Programs? What Else Can I Expect From an Online Bachelor's in Journalism Program? Journalists are storytellers who investigate newsworthy issues and present vital information to the general public. Students choose careers in journalism because they want to work in fast-paced environments and cover headline-making events around the world. Among other exciting possibilities, journalists get to research and write stories for newspapers, websites, television, radio, and magazines. They also get to specialize in intriguing subfields like sports journalism, strategic communication, photojournalism, and emerging media. Journalism majors are not limited to jobs in reporting, however. Because they are skilled writers and multimedia specialists, they can launch careers in many related occupations including copywriting, videography, technical writing, marketing, and public relations. Reporters earn a median salary of $38,870, according to the U.S. Bureau of Labor Statistics (BLS), while radio and television announcers earn around $31,400 and public relations specialists earn upwards of $58,000. As an example of job growth in media related professions, demand for videographers is projected to grow 11% by 2024, according to the BLS. Digital learners who choose an online journalism degree must complete their school's required general education and major-specific courses, or transfer them from approved prior coursework. Certain journalism schools may permit you to design individualized programs from an array of practical courses like news writing, media and politics, interviewing skills, and visual storytelling. Many programs also allow students to select cutting-edge concentrations such as dynamic new media, international strategic communication, or documentary journalism. The nature of journalism is such that programs are intensely hands-on and have immediate applicability to jobs in news reporting, digital media management, advertising, and corporate communication. This is why many programs emphasize real-world experiences through practicums, portfolio creation, and internships. Though journalism is a rapidly evolving discipline, a series of courses in theory and fundamentals is an essential component of every bachelor's program, and learners can be sure to graduate with a solid understanding of journalism ethics and communication law. Many journalism programs also offer state-of-the-art courses in audio production, transmedia storytelling, and intellectual property. UMass Amherst is the flagship campus of the University of Massachusetts system. The school offers a bachelor's of arts degree completion program with a concentration in journalism through the University Without Walls. In this program, students learn about cutting-edge media technology from award-winning journalism instructors. The curriculum includes courses on a variety of topics, such as news literacy, news writing and reporting, social media and public relations, journalism and law, magazine writing, and media literacy. Students can transfer up to 100 credits of coursework earned at another institution towards their degree. All online students pay the same tuition rate, regardless of residency. Unfortunately, this online program is not available to students who live in Alabama or Arkansas. Applicants must have already completed at least 12 credits of college coursework with a minimum GPA of 2.0 to be considered. UMass Amherst is accredited by the New England Association of Schools and Colleges. NU offers a BA in digital journalism program that provides students with foundational knowledge in journalism while teaching them how to use multiple platforms to target specialized audiences. This 120-credit program includes courses on a variety of topics, such as news writing and editing, global journalism, editing multimedia, journalism business skills, and journalism on screen. Students must either complete a culminating capstone project or an internship in which they demonstrate their competencies in writing news stories, developing news packages, and shooting videos for news and other related content. Transfer students can apply an associate degree or other credits towards their degree as long as they were earned with a minimum GPA of 2.0. Applicants to this online journalism degree program must have a high school diploma or equivalent and have completed college-level English or math courses or the ACCUPLACER test to be considered. NU is accredited by the Western Association of Schools and Colleges. Regent offers a variety of affordable online programs, including the 120-credit BA in communication studies – journalism. This program emphasizes print and broadcast journalism as well as digital media. Graduates are prepared for a variety of careers in the field, such as reporter, editor, press secretary, or digital media production assistant. This online journalism degree includes general education classes on topics like biology, geography, history, and New Testament studies. Major coursework covers a variety of subjects, such as communication theory, public speaking, narrative concept and development, and communicating in the 21st century. Students must also complete a capstone project and internship in which they gain hands-on experience in a real newsroom. Applicants must be at least 24 years old and submit high school or college transcripts and SAT or ACT scores to be considered. Regent is accredited by the Southern Association of Colleges and Schools Commission on Colleges. Olivet offers a BA in journalism through its School of Journalism that prepares students to become professional journalists who are committed to Christian values. The curriculum incorporates core studies in general education, the Bible, and journalism. The four-year online journalism degree includes courses on a variety of topics, such as news writing, reporting, media law, audio and video production, and public relations writing. Students must also enroll in 20 units of electives, allowing them to customize their degree based on their career goals. Electives include ministry internships during which students spend a minimum of 20 hours a week immersed in on-the-job journalism training. Applicants must have a high school diploma or GED with a minimum GPA of 2.5 to be considered. The school accepts transfer credits as long as it was earned with a minimum 2.0 GPA. Students are also expected to earn a minimum 2.0 GPA during their first semester at Olivet. Olivet is accredited by the Higher Learning Commission. Online journalism bachelor's degrees differ in mission and emphasis. Most programs, however, offer theoretical and practice-based coursework for students seeking careers in news and storytelling, and advanced coursework can be tailored to suit student interests. In general, you will acquire foundational knowledge of reporting standards in order to engage with high-impact news stories, controversial topics, or even natural disasters. Schools and departments offer a variety of coursework and diverse concentrations depending on their university's mission and the overall philosophy of each journalism department. The coursework below is typical of the classes offered by online bachelor's degree programs in journalism. Visual Media: An introduction to visual art forms, scripting styles, and color, this course teaches learners to incorporate visual elements into news stories and corporate communication across media platforms. Typically, students learn to use various software programs such as Adobe Creative Cloud. International Journalism: Focusing on the critical issues facing global mass media, this course explores the relationship between journalism and democracy along with the major causes of global problems from cultural, economic, political, and scientific perspectives. International journalism helps prepare students for careers in international news writing, international relations, or science journalism. Magazine Writing: This class teaches students to apply exacting journalistic standards to stories for print and online media outlets. This course can include components of editorial writing as well as feature writing. Sometimes, the course is paired with editing for magazines, which emphasizes grammar, copy fitting, proofreading, and rewriting. HOW LONG DOES IT TAKE TO GET AN ONLINE BACHELOR'S IN JOURNALISM? All online bachelor's degrees in journalism require students to complete at least 120 credit hours of approved coursework, equalling about four years of full-time study. Students entering a program with transferable credits can reduce their overall time to graduation. Some schools accept up to 100 transfer credits toward their online journalism degrees, and others consider life experiences such as military or corporate training in lieu of traditional coursework. Programs that operate on five- or eight-week schedules instead of a traditional semester-long format may reduce a student's study to as few as 29 months, even without transfer credits. Some schools permit exceptional students to take two courses every five-week period, and others are structured so that students take two courses every eight-week period. Programs that use semesters are usually limited to five or six courses in the fall and spring semesters, plus limited summer options. Online learners considering a bachelor's in journalism should seek out degree programs holding both regional and national accreditation. Regional accreditation is more widely recognized and more stringent than national accreditation. Schools accredited with one of the seven regional bodies must meet stringent coursework requirements, hold rigorous academic standards, and display evidence of financial longevity. National accreditation bodies focus on trade and vocational offerings. Journalism programs can be also be accredited by the Accrediting Council on Education in Journalism and Mass Communications (ACEJMC). The Council on Higher Education Accreditation (CHEA) designated ACEJMC as the organization to evaluate and approve professional journalism and mass communications programs at colleges and universities. Digital learners should be aware that a nationally accredited school will typically accept credits from a regionally accredited school. The reverse is rarely true. Both accreditations are ideal, but regional is more valuable when considering transfer options. The U.S. Department of Education (DOE) and CHEA both approve regional and national accreditation agencies that help institutions meet standards of educational quality and operational consistency. DOE and CHEA work together to set guidelines for regional accreditation organizations. Legitimate higher education accrediting agencies have secured endorsement from one or both of these agencies. Most colleges offering an online journalism degree have received regional accreditation. Some have also secured a stamp of approval from the ACEJMC. You can find a list of all accredited schools on the DOE and CHEA websites. Aside from traditional reporting, an online journalism degree makes an ideal entry-level academic background for marketers, public relations specialists, and writers. The BLS has shown that marketing, public relations, and writing are all growing occupational fields. Marketing has an especially bright 10-year job outlook, with a projected growth rate of 19%. While traditional news reporting jobs are in slight decline, journalism remains the most lucrative communications major according to a recent survey from Georgetown University's Center on Education and the Workforce. Using findings from PayScale, the table below illustrates the salary growth potential for journalists over time. Students invest in an online bachelor's degree in journalism to meet the standard of entry for most journalism-related professions. Across the spectrum of media and communication work, professionals earn an average of $54,780, outstripping the national average salary by almost $7,000 per year. Public relations specialists, technical writers, and film editors can earn considerably more than the field's overall averages. Students who earn an online journalism degree can position themselves for dozens of career opportunities in media and communications. From advertising and public relations to politics and corporate communications, there are many occupations that call for the strong storytelling skills journalism majors acquire. Students who love working at a fast pace in a rough-and-tumble office environment can focus on political speechwriting or news reporting, while those who prefer more solitary work as editors or copywriters can pursue careers working remotely. These professionals are on the front-lines in journalism, reporting on news and events at the local, state, and national levels across a variety of multimedia platforms. Reporters and correspondents work to meet tight deadlines while conducting interviews, researching news stories, or writing articles for newspapers, blogs, and magazines. Editors plan content, review articles, and make revisions prior to publication. They work with writers to develop stories, fact check submissions, rewrite text for readability, and proofread for errors. Managing editors are responsible for a publication's daily operations. A bachelor's degree in journalism or a related field is required for many editorial positions. Public relations specialists represent a company, nonprofit, government agency, or other organization to the general public. Their goal is to increase awareness of their employers' mission and to shape public perception around the issues important to them. Working in a lucrative field, public relations professionals are used to crafting many types of written information across multimedia platforms. Copywriters develop written content for advertising and promotional materials. Sometimes called “salesmen in print,” copywriters help companies sell products and services. These specialized writers would benefit from concentrating in writing courses during their bachelor's degree. Video editors use software to organize digital footage while camera operators shoot raw footage, usually on-location, in order to tell a story. Videographers can also sell their camera and storytelling skills to private clients. Journalism degrees can offer specialties in photojournalism to train video editors and camera operators. Establishing a professional network and learning about different approaches to journalism helps lay the groundwork for career success. Professional organizations offer outstanding resources to digital learners seeking to advance their knowledge of a chosen career path. Below you'll find three of the country's most prominent associations for journalists. These organizations facilitate professional connections, offer online and in-person training, and maintain active job boards for career-minded college graduates. Founded in 1909, SPJ represents 9,000 members across 300 chapters. It offers a legal defense fund to help protect journalists' first amendment rights and honors excellence in journalism with the Sigma Delta Chi awards. First organized as the Society of Magazine Writers in 1948, ASJA now represents more than 1,000 freelance non-fiction writers and journalists. It offers mentoring, financial grants, and an annual conference. IRE hosts an annual conference as well as online training sessions, boot camps, and traveling workshops. It also provides mentoring, scholarships, and fellowships. It's headquartered in Columbia, MO at the University of Missouri's School of Journalism. Most online programs are relatively affordable, but many digital learners still require financial assistance. Students should complete the Free Application for Federal Student Aid (FAFSA), which helps applicants fully understand funding opportunities such as scholarships, loans, grants, and work-study programs offered by the U.S. government. In addition, nonprofit organizations, companies, and other donors provide funding through competitive grants and scholarships. Check out the guides below to learn more about financial aid that may available to you.